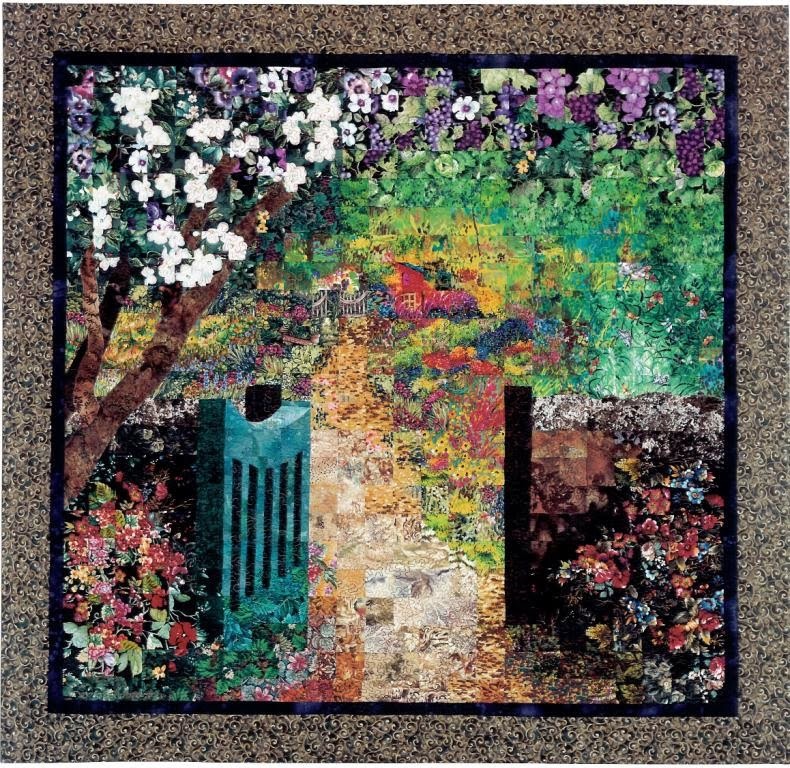 In the SAQA email list the topic of different art quilting styles has come up. It is very interesting to me since I was not a traditional quilter ever. Coming from a general art background I have tried many different kinds of art media. When I was young, I used to draw my parents' hands when they played cards at my grandmother's house. I loved to draw realistically. When in high school I tried lots of different media and really liked painting and drawing, not sculpture so much. When I was in my 20's, I only did pen and ink portraits in pointillism style. I loved to draw people with lots of character (and wrinkles). This is one of my pen and ink pieces. I did lots of American Natives. I once had several pieces in a gallery in Alaska when I lived there. The gallery manager stole all of them plus other people's pieces and I never saw them again. The piece below I created for a competition on our local radio station for the Statue of Liberty bicentennial. It's a pen and ink pointillism piece too. I was sure I wouldn't win but did when only a hand-full of others also entered. I won a trip to New York City for two for a weekend plus saw Cats on Broadway, plus a concert of Tommy James and the Shondelles and a New York City boat tour, plus all airfare, hotel, and food for the weekend. It was amazing! After spending many years doing this style of art, I decided to try other things. My mom and I made these cute little houses out of lichens we found in the woods like the one below. That was fun. When my kids were little, I crocheted many afghans. I always needed something creative to do. Then when I got older like in the late 90's I discovered fabric as an art medium. I saw what others were doing and I wanted to try it too. So I used 2" squares to create impressionistic designs. I really loved doing this and did so for 10 years, then had to try something else. That's when I started fusing. What is wrong with doing that? There are hundreds, probably thousands or more ways to manipulate a medium and why not use fusible web to keep your fabric together until it's stitched? I don't agree with people who say that just because it looks realistic or it was stuck together with fusible it's not art. I work from my own photos that I took which isn't an easy thing to do. Then I use fabrics I buy to recreate them. Finding fabric that works, using it make whatever you want it to be, having the right value, color and texture, all are a complicated process that make the piece work or not. My piece, Capturing Brittany shown here, just won Outstanding Art Quilt. Does that mean that the people who chose it don't know what they are talking about? I think they just liked it. Lenore, you are a fantastic artist! I absolutely love the work you do with your photos and the fusible. Someday, I hope to take a class with you. Just don't stop before I can get there! LOL! I, too, saw the art quilt at Road. I stood before it for a long time, I liked it so much. I admire your work so much, Lenore! Have just come from your website. Which CD do you recommend as the first one for a quilter starting out on new creative path. I've done the impressionistic designs. Thank you for sharing your beautiful art pieces. obat hepatitis untuk ibu hamil. Cara Mengobati Hepatitis B Anak. obat hepatitis untuk ibu menyusui. pengobatan hepatitis anak dan dewasa. obat infeksi paru-paru anak dan dewasa. Hi Lenore, do you ever get to Long Island? I love your work but am new to the idea of fusible quilting. I have so many questions. Your work is amazing. Learning to understand that not all wishes can be met, perhaps the best remedy to prevent disappointed and hurt. Cara Membuat Antibiotik Alami untuk Hilangkan Infeksi. Obat Penghilang Gejala Alergi Bulu Anjing Anak dan Dewasa. Intention is to assess the true size of an act. Apakah Ibu Hamil Boleh Minum Obat Maag?